A few months ago I ticked a project off my bucket list and went to a leadlight/stained glass workshop for a couple of days. Several people commented that they'd love to see what my next attempt would look like now that I had the hang of the basics. Well, the next project is somewhat bigger and is being done in three stages - starting smaller and getting bigger and being inserted into our staircase. This is phase 1. We have a very ordinary looking staircase rail and I have long pondered a solution to it. My husband did a "creative welding" course one year and I'd hoped he might translate that to the stairs but he never felt the inspiration to do more than the one piece that sits by our front door. 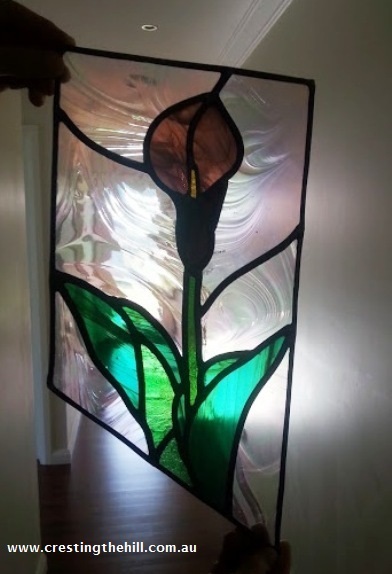 So the stairs have been on hold for the five years we've lived here...... until I started looking around for my next stained glass piece. With some help from my arty/computery husband, we figured out that we could take out every second stair rail and replace them with three panels of calla lilies (one of my favourite plants and a little art nouveau-ish - which I also love). It took a while to get everything proportioned in a way that we were happy with (we also discovered that the stair railings weren't as perfectly even and straight as we'd first thought!) But the end result is pictured above and stayed up for a couple of months with visitors giving it the thumbs up and with me itching to get started. Once Christmas and the holiday break was over it was off to my stained glass teacher/guru - Nigel, to see if what I wanted to do was a possibility or whether I'd bitten off more than I could chew. 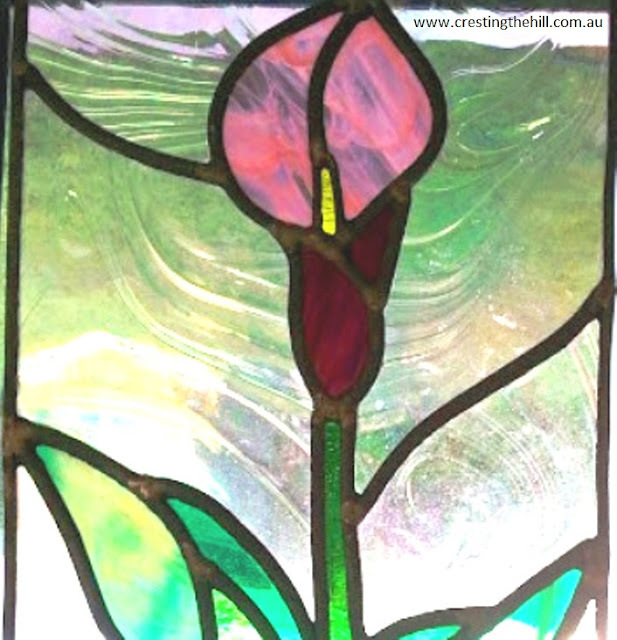 He was very positive and jumped on board with the idea, so we leapt straight into choosing glass colours and textures and making a date to begin. I liked the idea of being able to call upon his expertise when I hit tricky bits - it saves a lot of messing around if you don't cut something at the wrong angle and then have to re-cut it or start again! 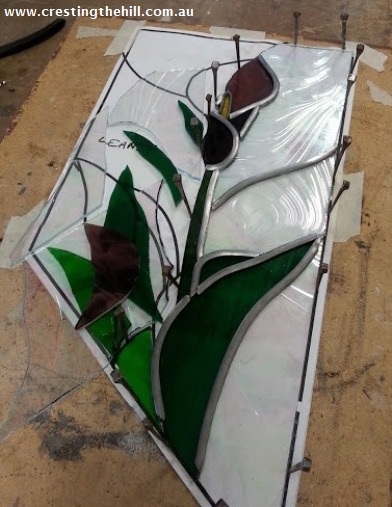 It's a long and involved process cutting the different coloured pieces of glass and fitting them together with the lead - that took up my first session and I had to leave it half assembled. This is half way through with the pieces in place and the lead ready for the outer frame. Then all those little joints get soldered - then you turn it over and solder all the joints again on the other side! Finally you fill it all in with cement to hold the seams together, clean off the excess, buff it up and the finished product is ready to take home. This is the smallest panel and I'm hoping to get faster as I progress through the other two bigger ones. Next week I get stuck into panel number 2 with two lilies in it. I can't wait to see how it turns out and to see them in situ once the third one is finished. 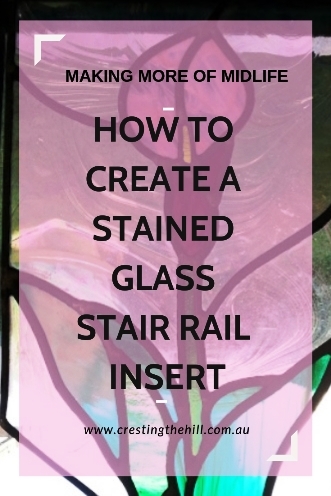 We're talking about having the stair rails powder coated to turn them black to tie it all together. I'll be back next week with my phase 2 report. thanks so much - I'm really looking forward to seeing how it all turns out. my pleasure and I think it will make a big difference to those boring stair rails! It's a lot more straightforward than it looks Jenna - just really fiddly but if you are good with details then it's fun to do. 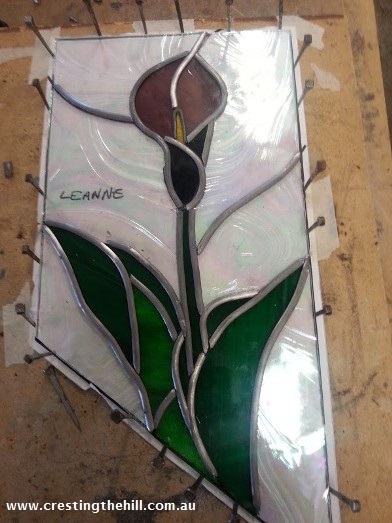 It's soldered at every joint front and back and then cemented where the glass slots into the lead. It would take a fair amount of force to break it & fortunately that wouldn't happen on the stairs (hopefully!) I wanted to make sure it was pretty childproof for the grandkids too. Those are beautiful!! Calla lilies are one of my favorite flowers!! thanks Stephanie - I love them too! I am mesmerized, Leanne. This is gorgeous work! It is so beyond my level that I don't even know what else to say. Leanne, I am so impressed with your creative mind and your new skill. I love the staircase that you've designed it is unique, arty, and just plain fabulous. You have picked up the skill and are making it your own, I am so impressed and inspired by your talent. I can't wait to see it all put together! thanks so much Nikki - I'm loving finding something that I have a talent in - it utilizes a lot of my perfectionism and yet it's still pretty! This looks awesome Leanne. I think this is such a rare and brilliant talent to have. Well done you on getting out there and learning this art. You should be so proud. I love stained glass. I was mesmerised by the Sagrada Familia in Barcelona and would love to recreate a little of that at home. If only I had the time! Good luck with phase two. thanks Sally - I saw the Sagrada Familia too and was blown away by the stained glass (and all that carving on the outside) I think I'll stop before I end up with a cathedral! Leanne, this is so cool! I can't wait to see the finished project. You'll be able to look at them and know that YOU did it and feel very proud. Thank you for sharing this with us at the Over the Moon Link Party. Oh my goodness Leanne - this is gorgeous! What a beautiful addition to your home, especially since it is your own artwork on display! I can't wait to see a final photo.